2008-2011 Mitsubishi Lancer 2.0 + 2.4 2WD Injen Cat Back Exhaust w/ Hi Flow Cat + Titanium Tip5LunchboxSeptember 17, 2010I love my new engine exhaust. Right when i put it on you get the looks on the road but the power to back up those looks. 60mm (2 3/8 inches) diameter, including a high flow catalytic converter and 4 1/2" Titanium tips. 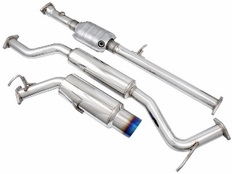 The part number for this exhaust system is SES1835TT-1 and it fits 2008-2011 Mitsubishi Lancer 2.0 AND 2.4 models.